When I am not weaving the twill gamp curtain panels, and by the way, I’ve started the second one, I have taken up crocheting. This is a slippery slope for me. I have always loved to crochet but every time I begin doing it I get obsessed with it and I don’t quit soon enough. The house can be absolutely quiet and I will lose hours while crocheting. This is probably the closest I ever get to meditation. I mentioned that I am taking a class at Gate City Yarns. I have also mined Ravelry and Interweave Press website and the Interwebz in general in search of free patterns, not only in Tunisian crochet but any crochet. When I quit smoking 24 years ago (and I think that yesterday was my anniversary for that!) I crocheted many snowflakes and Christmas ornaments. Even though I am not a lacy kind of gal, I hooked up a lot of doilies and delicate filet crochet thingies. A lady came to my house and bought most of my ornaments right off my tree. After that, my tendinitis cranked up, and I got rid of my crochet thread and itty bitty hooks, and vowed to never do it again. That wasn’t the first time I made that vow. WELL. BUT…this is TUNISIAN crochet! It might be different! And I have SO MUCH YARN. 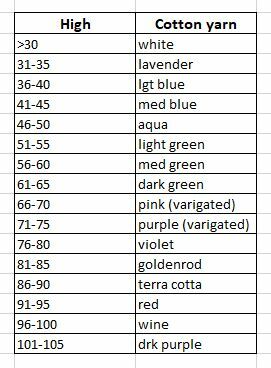 Then I looked up the high temperatures for each day on Weather Underground and made a chart with the corresponding colors. Then I started stitching one row for every day. Yesterday I caught up to the current day and it is not enough! 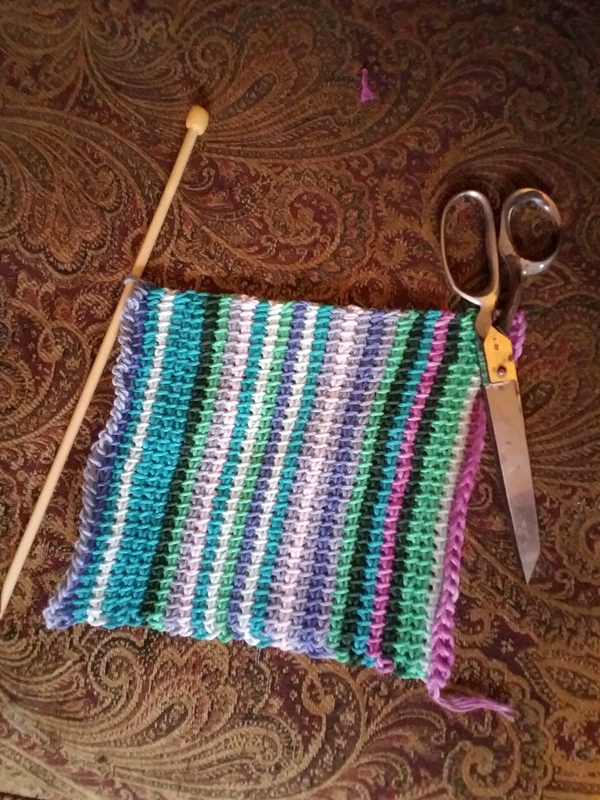 So I also have a regular crochet project in which I am making dishcloths and produce bags with the long yarn waste from my current weaving project. 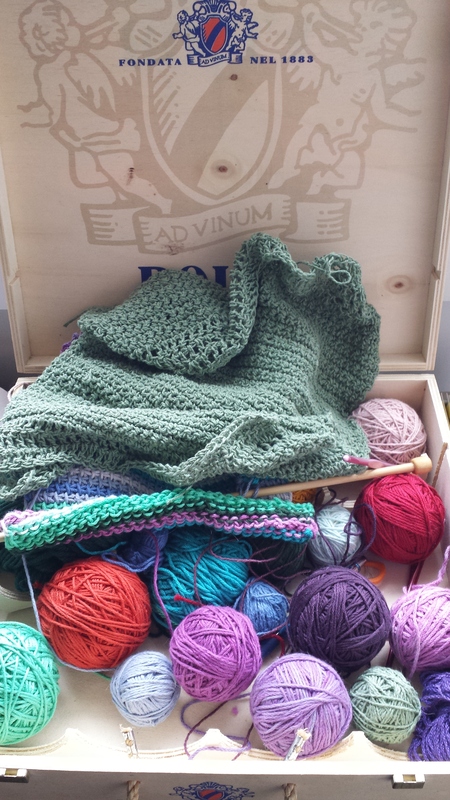 My buddy the Fabulous Zha K gave me a bunch of interesting boxes and tins on her way outta North Carolina and this wooden wine gift box turned out to be the perfect container to keep my current crochet projects together. I hope that this will work out and I can be wise about it. I am weaving standing up and when I need a break from that I sit down and crochet. In the meantime, nothing else is getting done, unfortunately. These seeds aren’t going to plant themselves. Thanks for posting the chart. How do you hide your ends so well.? You’d see them if you saw the actual thing! That’s one thing I don’t like about this, weaving in the ends. In regular crochet I stitch over them.